The Great Northern Hotel, Leisure Centre and Golf Course stands proud and majestically on the cliffs overlooking the wild and rugged Atlantic Ocean. Surrounded by the emerald greens of our championship 18 hole Golf Course, you will struggle to find a better venue that emanates all the best characteristics and features of the Wild Atlantic Way. The Great Northern Hotel provides the perfect place for your photographer to catch all the precious memories of your perfect day. With each and every turn you take you see a brand new enchanting backdrop and no two photos will ever be the same. 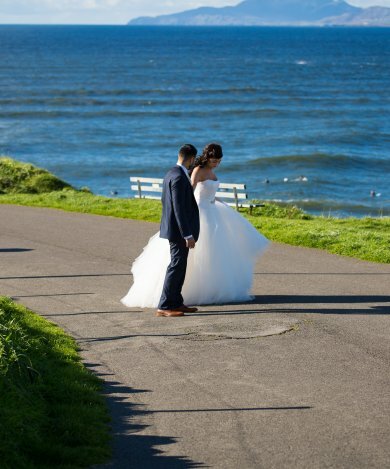 Your guests will marvel at the breath-taking views available, long before they reach your reception on arrival. Step inside our hotel lobby where the warmest of welcomes awaits you, your family and your guests. Established in 1894 this delightful family run venue has real “old world” charm. 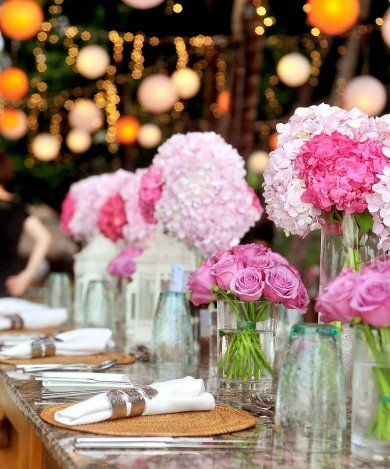 Our experienced staff are on hand to see that all your guests and their every need is catered for. Our hotel lobby is luxuriously furnished to ensure comfort and warmth whilst you and your guests sample the delicious canapes and sip on chilled champagne. In the cooler months we can offer to warm your guests up with our signature house mulled wine. The Great Northern Hotel endeavours to provide an experience for you and your guests that will be remembered long after your first anniversary. You will receive food and beverage guidance from our wedding team to deliver a menu full of flavours whilst making sure every dietary requirement is catered for without compromising on taste. Our splendid wedding room can accommodate comfortably large family weddings and can be adjusted to suitably hold personal and intimate family weddings. The room is beyond beautiful when dressed for your special day. 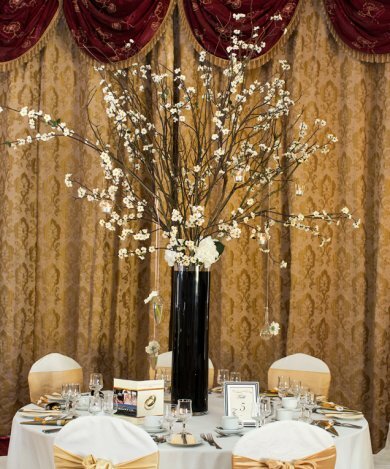 Crisp ivory table cloths & chair covers with gold satin sashes compliment the spectacular Atlantic Suite. Finished with tall solid silver candelabras for that extra sparkle, personalised wedding menus and mood lighting around our chandeliers – your venue is simply waiting for you, your partner and your guests to arrive and enjoy your meal with first class professional service. Our Top table sits high under a backdrop of sophisticated white drapes with sparkling fairy lights. Here, you along with your bridal party and parents can view all the guests whilst enjoying your wedding meal. As the sun sets on Donegal Bay your guests will be mesmerised by the outstanding natural beauty of their surroundings. Floor to ceiling windows in our wedding room allow all guests to savour the sunset without moving from their seats. A perfect end to a perfect meal – but the night is not over yet. We will help you facilitate any extra entertainment you wish to provide for the enjoyment of your guests. Our wedding team will guide you through the day putting you in the right places at the right times in order to get full value from all the vendors you have chosen to work with. From your first meeting with Karen and Lee you will be sure to have instilled a firm friendship - You and your partner will be able to sit back relax and enjoy, whilst we take the hassle out of the lead up to your special day. If this sounds like the perfect day for you please do not hesitate to contact us at the hotel on 00353 71 98 41204 or email us at Karen@greatnorthernhotel.com where we assure you of our personal attention at all times.